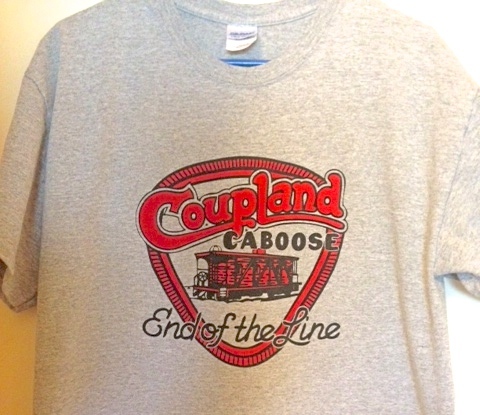 Choo Choo Fest is a Coupland Civic Organization (CCO) fundraiser. 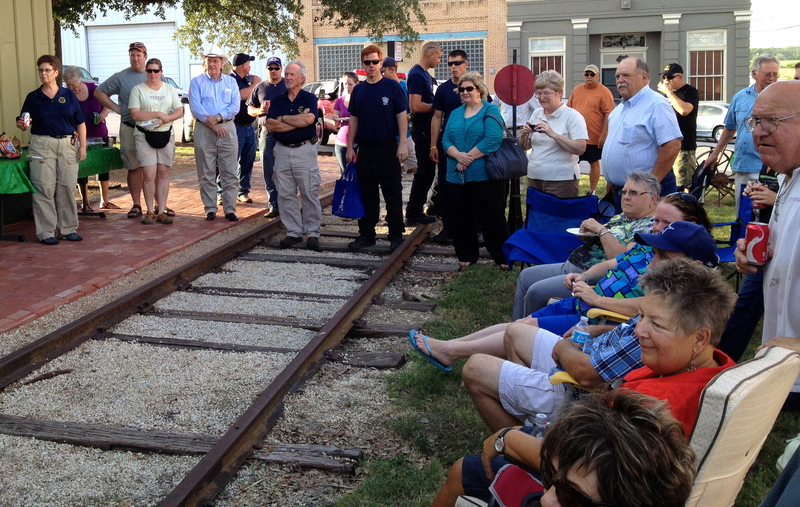 The very first Choo Choo Fest was in 2008 and was held outside, in downtown Coupland, and the funds raised went to restoring the Depot. 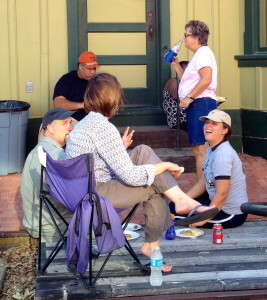 Then, after skipping a few years, Choo Choo Fest was held again in 2013, this time inside the Old Inn and Dancehall, in partnership with Tim and Barbara Worthy, with the funds raised allowing the CCO to begin restoration of the caboose. So this 2014 event was the Second Annual Choo Choo Fest. These two Fests that have been held inside the Inn have kept attendees out of the August sun in air-conditioned comfort. Also, serving the meal has been much more convenient inside. Attendees enjoyed the barbecue dinner. For a minimum $10 donation, the dinner included barbecue chicken, pulled pork, beans, cole slaw, potato salad, bread, and iced tea. This year’s bake sale featured a huge array of homemade desserts, sold whole or by the serving. Also at the bake sale booth, Fundraising Co-Chairs Ruby Wabbel and Judy Downing sold the new Choo Choo Fest T-shirts. The silent auction was so big, it overflowed its space. During the Fest, people were still bringing in auction items, and some ended up being displayed on the bar. The auction included original artwork, crafts, collectibles, toys, and more. On the Dancehall stage, volunteer bands provided live music throughout the event, which raised about $6,800! The CCO thanks all the directors, their families, and other community members who volunteered. And a special big “thank you” to Barbara and Tim Worthy whose generous donation of food, the use of their facility and the help of their staff made Choo Choo Fest 2014 possible. This entry was posted in Entertainment, Social, What's New? and tagged caboose restoration, Choo-Choo Fest, Coupland Civic Organization, Old Coupland Inn & Dancehall on September 3, 2014 by Stewart Dale Spencer. 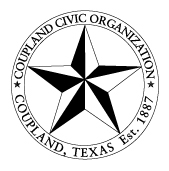 The Coupland Civic Organization (CCO) will hold its monthly meeting on Monday, April 28, in the Fellowship Hall of St. Peter’s Church of Coupland. Representatives from community organizations will present news from their groups. Speakers will include Coupland Mayor Jack Piper, Neighborhood Watch Coordinator Barbara Piper, and representatives from Manville Water Supply Corporation. The CCO will host a barbeque-on-bun supper at 6:30 p.m., and the program begins at 7. This entry was posted in Social, What's New? and tagged Coupland Civic Organization on April 26, 2014 by Stewart Dale Spencer. The Coupland Civic Organization will hold its monthly meeting on Monday, February 24, in the Fellowship Hall of St. Peter’s Church of Coupland, not at the fire station. Dr. Dana Boehm, a veterinarian in this area, will discuss her recent mission trip to Kenya where she helped villagers become more self-sufficient in their agricultural practices. The Civic Organization will host a pulled pork sandwich supper including chips, tea, and dessert at 6:30 p.m., and the program will begin at 7. This entry was posted in Social, What's New? and tagged Coupland Civic Organization, Coupland Texas, Dr. Dana Boehm on February 24, 2014 by Stewart Dale Spencer.